Photographer(s) Appreciation: Thank you to sergio niebla@Flickr for sharing his image of Agaricus bisporus via the Botany Photo of the Day Flickr Pool. Muchas gracias! These common names are applied differently depending on the age and colour of the fruiting body. Most are used for the reproductively immature fruiting body of white-bodied mushrooms. This is somewhat of a recent phenomenon. Prior to a century ago, all of the immature mushrooms in cultivation were light brown, until a white-bodied mutation was discovered by a Pennsylvania farmer in 1926. This quickly became the choice strain for commerce, occurring contemporaneously with the industralized production of sliced white bread. What’s old is new again, though, so a reintroduction of immature light brown-coloured mushrooms termed “crimini” is also on the market. As the mushrooms mature, they then become known as / marketed as portobello mushrooms (most? all? of these are from mushrooms that were light-brown in immaturity). Agaricus bisporus can now be found in many regions of the world, although it seems like its original range is the grasslands of Europe and some parts of North America. In North America, it exists as both a native and introduced species. Most genetic lineages in North America have genetics from European cultivated strains, but distinct North American populations are known from montane New Mexico, montane Alberta, and coastal California. 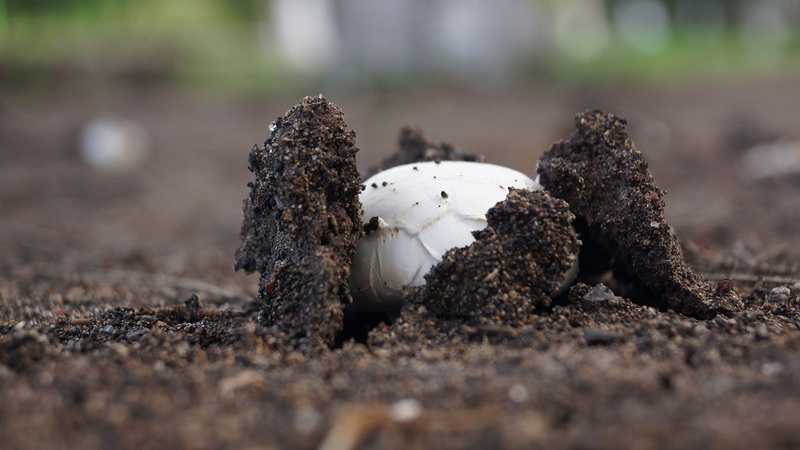 See Michael Kuo’s account of Agaricus bisporus for more, plus some fungi fun (e.g., “Ecology: Scattered on pizzas, gregarious on salads, densely clustered in grocery stores—and occasionally scattered to gregarious on manured soil, compost piles, in lawns, and so on”). Tom Volk also has an excellent article on Agaricus bisporus, including details and photographs of cultivation. A close relative, Agaricus campestris is also widely-consumed, but only through foraging. This relative matures faster and has a shorter shelf-life, so it is generally ignored by the food industry. love it when you include fungi! interesting to hear about native plus introduced strains and the history of white stuff 🙂 I have lived in the US for about 30 years now and I still hate American bread with a passion. Thanks for including the link to Tom Volk’s article. I never realized how involved the process is to produce commercial mushrooms. Thank you for enlightening me – it seems stupid, but I never realized portobellos are the same species as “regular” white mushrooms in the supermarket aisles. Nor did I know the details about white and brown varieties, but the history is no surprise, in this country. Thanks for the links, too!